NOW!!! Dr. Karen Wyatt shares the wisdom she has learned from years of medical practice and her own personal spiritual journey. Filled with stories from her work as a hospice medical director, this book presents a profound opportunity to embrace the difficulties of life and wake up to the presence of the Soul. 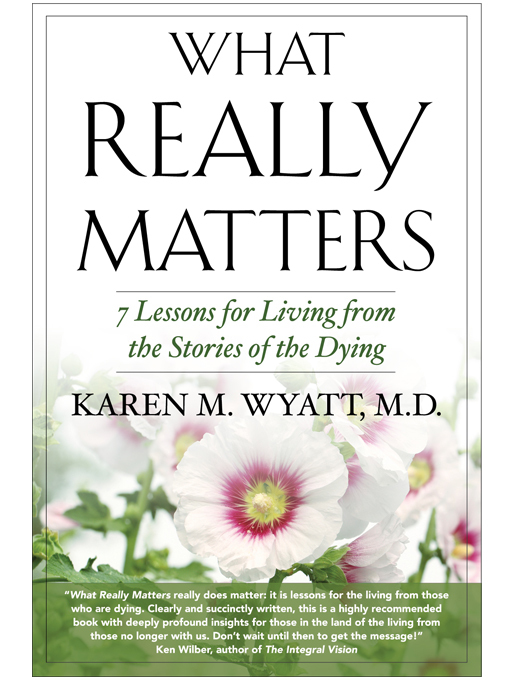 Through the stories of dying patients and the 7 important spiritual lessons they learn at the end of their days, What Really Matters shows us how to live our lives NOW! These 7 Lessons of the Soul form a step-by-step map for spiritual awakening and teach us why we must focus on what really matters in order to evolve our consciousness. Buy now to receive an autographed copy of What Really Matters and you will receive the What Really Matters Workbook available for instant download.